Our dogs are our house dogs and are our pets first and foremost. We normally have 8 Brittanys at home, and more out with our field trainers. Our two adult sons also enjoy the dogs and are great dog sitters when we need their help. We enjoy success in the conformation/breed ring as well as competing in hunt tests and field trials. As part of our commitment to the sport of dogs we enjoy judging AKC dog show events and sharing our knowledge with others. We average two litters of puppies a year. 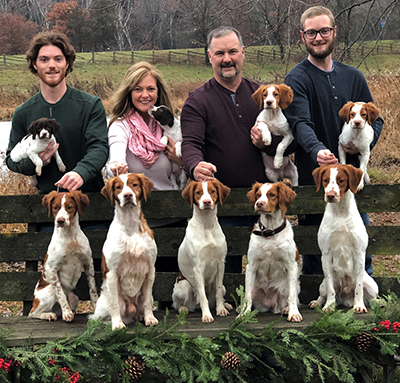 We are members of the American Brittany Club, Minnesota Brittany Club, Maple Island Hunt Club, Minnesota Purebred Dog Breeders Association, St. Croix Valley Brittany Club, Land O’ Lakes Kennel Club, and Santa Barbara Kennel Club. We have made a commitment to breed only the highest quality Brittanys, maintaining a high level of ethics adhering to the Brittany standard, and promoting the "dual dog".We are extremely selective on the animals we breed -- temperament being top priority, but hunting ability, show potential (correct/sound conformation), and freedom from hereditary problems are necessary prerequisites for our breeding stock. We pride ourselves on the fact our dogs are wonderful, quiet family/house dogs but will perform in the field, show, agility, and obedience events successfully and with all their heart. Joe started out in Junior Handling at the age of 10 with Weimaraners, which his folks bred. His parents were professional dog handlers and he traveled with them and helped condition, train, and show the dogs. My Father, Dr. Charles Westman, practiced traditional veterinary medicine for many years and then specialized in acupuncture, chiropractic, and allergy elimination for dogs and horses before his retirement. I put my first obedience title (CD) on an Australian Shepherd when I was 10 years old and showed Aussies with my Mom in breed, obedience, and Junior Showmanship. Joe and I were all-breed professional handlers for many years, before we became AKC breed judges. We also took time out to raise two wonderful sons Jake and Zach, who also share a passion for the Brittanys. Our first Brittany wasNBOB/BIS/BISS CH Chesabrits Code of the West CD("Cody"), who was born in 1984 and came to live with us at the age of 8, after having been retired from his position as the #1 show Brittany in the country. After getting him back in shape, we entered Cody at a couple specialties, which he won from the Veteran's class. We also took him up to Canada, where he finished his Canadian championship with two Group Firsts and a Best in Show. 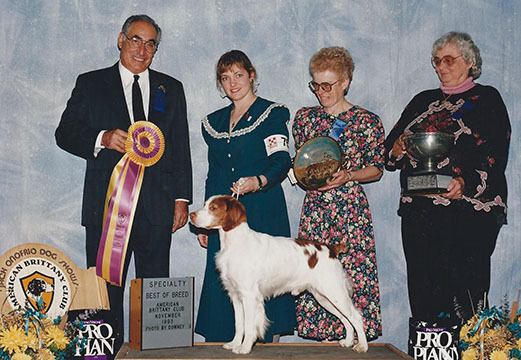 We decided to go to the American Brittany Club Nationals that year (1993), where we entered Cody in Novice A obedience, the Veterans Sweepstakes, and the regular Veterans class. He won the sweepstakes, took first place and qualified in the Novice A class, and went on to win his second National Specialty, this time from the Veteran's class! Some of our first Brittanys after Cody got us hooked on the breed, were Ch. S Chilcote Creditors Dow Jones ("Jonesie" - Cody daughter), Ch. Chilcote's Sovereign Allspice ("Spice"), BISS Ch. Sovereign's Know the Code, JH ("Moose"- son of Cody & Spice), and BISS Sovereigns Chase the Code MH (Junior a Cody grandson) all of which you can see on our Sovereign Champions page.Thank you for visiting our website. If you have any questions or would just like to chat, please feel free to Contact us.